At one point, the above quotation would have made me quite nervous as I tried to think about how my life fit into it. What did it mean for my faith if my life didn't fit that model? Did I have faith at all? At this point, I know that my life doesn't fall easily into this construct, and that's okay. 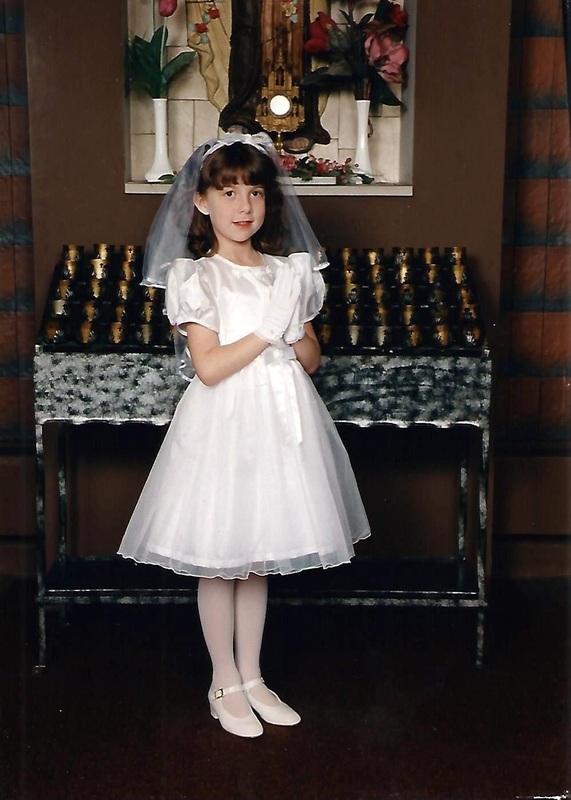 Towards the beginning of her journey... a second grade Megan at her first Communion! Earlier this week, Ed wrote a wonderful post about his journey from atheism to Christianity that prompted me to reflect a bit on my own journey, a task made slightly more difficult by the fact that there is not a particularly distinct “from” or “to”. This used to be a significant disappointment. I was once envious (and honestly, sometimes still can be) of Christians who could describe a moment or an event in which they were “saved” and definitively came to Christ. This was not my journey (and is not the way many Christians who do come from other backgrounds would describe their experience either). Raised in the Catholic Church, my life has always had, at some level, belief in God in the background. There was no one commitment to Jesus. There was no glorious moment of salvation, as far as I can tell. As a child, I prayed most nights before I went to sleep, for my family, for protection from the monsters conjured by my overactive imagination, or for the crush I had developed on a neighbor boys, prayers just as genuine and faithful (if not more) than any that I say today. Many times, I've seen people acknowledge their Christian upbringing and even a belief in Christ, then portray it as something less-than-real than their first true encounter with God. Though it is tempting to pick a place on my timeline and say from then on I was in genuine relationship with Christ, that is not something I could do without feeling like I was undermining valid childhood experiences of God. To some extent, I can view my journey in shifts: times when faith moved from a background aspect of life and identity to something in the foreground. There may not be one grand moment, but there are multiple moments of claiming and reclaiming Christ for myself. There is ebbing and flowing. There is wandering from God and being drawn back into God. There is a belonging to God that exists through both of those stages. There was an infant baptism that I can't remember, a feeling in the sixth grade that I wanted to make my faith my own, and a tentative confirmation in the Catholic Church in the eighth grade though I suspected I might one day leave the tradition for Protestantism. There were numerous times as a teen or preteen where I prayed and invited Jesus into my heart, a formulation certain Christians suggest is necessary for salvation—prayers that, looking back, make little sense knowing that Jesus was already present and had been so for years. There also were, on occasion, worries about my faith counting, about things sticking, without that clear, cut-and-dry prayer or a clear, cut-and-dry moment. As a teenager, I had intense periods of questioning of my faith. In the throes of my most doubtful times, I thought things would be easier if I had such a moment--if I was able to have a demarcation of "Before" and "After" and distinguish all the changes and developments in my life that could be attributed to God, thus proving God's existence and goodness. I now know that this attitude simplifies the lives of others. As Ed's post suggests, a conversion experience doesn't eliminate experiences of doubt or the existence of questions. A conversion experience doesn't have to be flashy at all. It may be as quiet and gentle as a life that has been lived circling around God, a center of spiritual gravity that keeps pulling one back....or, you know, it may not be. It may be the dramatic, drastic affair that used to make me jealous, though that certainly doesn't make the walk any simpler. I can now identify my jealousy with a desire to control the way that God works in my life. Instead of appreciating the ways God speaks to me as a unique individual, I have often been guilty of coveting what seems to be a clearer, louder voice in the life of others. Coveting diminishes the power and beauty of my own experiences and the gratitude I should feel for the ways I have experience God. It should really not come as a surprise to me that the God of the universe does not kowtow to my personal preferences in the way she interacts with me—especially since I cannot even manage that much control over the development of my relationships with peers. I constantly need to grow in trust that the God who has created me and knows me intimately also knows the ways that are fit to reach me. I am at a place where I am starting to appreciate the gifts that come with my particular journey with God. For example, I have come to see that our life with God isn't just going to be an upwards trajectory of growing closer and closer to God or behaving more and more like Christ. Though I am still quite young, I have been on this journey long enough to start moving past these idealistic expectations. Perhaps this has helped me to avoid confusing my stumbling, which I know will happen, with the end of the road in terms of my faith. Not having a defining moment of committing myself to Christ also inspires some humility. Though I do believe there are steps I have taken, out of choice, to come closer to God (and a variety of steps in the opposite direction), my journey overall undermines any temptation I might have towards pride and identifying my identity in Christ with my own decisive action. Instead, I must appreciate the tremendous grace of God placing me on and continuing to shepherd me back to this particular path. Of course, these gifts are available to others with stories quite different from mine, but I am happy to say I have found them through my particular story. Even so, I can't promise that the next time I'm in a setting where testimonies are emphasized that I won't be worried about the inadequacy of my own story—the story of a woman who has been, to some extent, a Christian all her life, who has faced insecurities and minor struggles, but who has not yet met any extensive suffering and cannot attest to any grand miracles. Many Christians communities view testimonies as an evangelistic tool. A quick Google search can lead to many articles, like the one quoted at the beginning of this post, giving advice about how to construct a testimony to appeal to those who aren't Christians. Though I believe God has been a powerful force in my life, I doubt I could ever tell my story in a way that would suddenly convince people to follow Christ. Thankfully, Christianity is about much more than my individual story. While I do believe that it is useful to share honestly about our faith and the role it plays in our lives, what is really important is the place my story takes in a bigger narrative arc—the one starting with God's creation of us in his own image, the one where God becomes one of us through Christ and loves us and suffers on our behalf, the one where we are offered life and forgiveness, the one where Christ is resurrected and reigns, the one where we can now participate in the kingdom of God, a kingdom of love and freeing the oppressed and caring for the poor, even if that kingdom is not yet here in its fullness. That story is the masterpiece, the drama that compels people to enter into relationship with the divine—not my own story, as much as I hope that my story attests to it. The God that stars in this narrative is, I believe,a God who can be surprisingly unsystematic, no matter how much we might want a system that could help us understand him. Sometimes God brings people to faith in a way that aligns with the three steps mentioned by Chuck Swindoll, but there are others that God meets in radically different ways. God is equally at work in those who cannot identify with these very distinct stages of life as those who can. God is equally at work in someone who, for instance, wakes up one day believing in God and someone who cannot identify when belief in God started. Instead of looking at other people's stories enviously, critically, or questioningly (tendencies to which I am prone), I strive instead to be open to hearing their stories and appreciating the ways God meets particular individuals. Isaiah 55:8,9 (NRSV) says, “For my thoughts are not your thoughts, nor are your ways my ways, says the Lord. For as the heavens are higher than the earth, so are my ways higher than your ways and my thoughts than your thoughts.” I often see these verses referenced in a way that promotes being closed rather than being open. Someone might throw out this quotation to shut down someone else who they perceive as questioning God, thus putting an end to what could be fruitful reflection or dialogue. Because of these associations, I sometimes cringe away from these verses and forget their beauty. In the context of our own stories of God and God's grace, I think they can be illuminating and actually lead us to further openness with God and each other. God is beyond our limited understanding. Our thoughts of how God works will not dictate the way that God does, whether in our lives or the lives of others. I have trust (at least, I have it today, as I write this—again, this is a journey of ebbing and flowing) that these stories God crafts are much better and effective than the ones we would choose for ourselves.